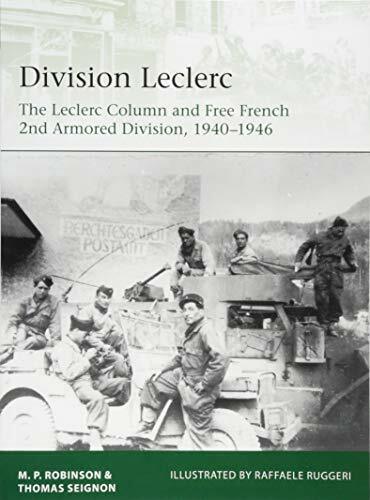 "General Leclerc" was the nom de guerre adopted by the Gaullist officer Philippe de Hautcloque, to protect his family in occupied France. He became France's foremost fighting commander, and his armored division (the '2e DB') its most famous formation. Starting as a small scratch force of mostly African troops organized and led by Leclerc in French Equatorial Africa, it achieved early success raiding Italian and German positions in cooperation with Britain's Long Range Desert Group. Following the Allied victory in North Africa it was expanded and reorganized as a US Army-style armored division, with American tanks and other armored vehicles. Shipped to the UK, in spring 1944, it was assigned to Patton's US Third Army, landing in time for the Normandy breakout and being given the honor of liberating Paris in August 1944. Combining a thorough analysis of their combat and organization with detailed color plates of their uniforms and equipment, this is the fascinating story of Free France's most effective fighting force.